Mission Veterinary Clinic & Animal Emergency Hospital has been providing veterinary care to animals since 1998. We are a full service animal hospital. Our Staff and Veterinarians at the Hospital do everything from Vaccinations, Spays, Neuters, Orthopedic surgery to Animal Emergency services. 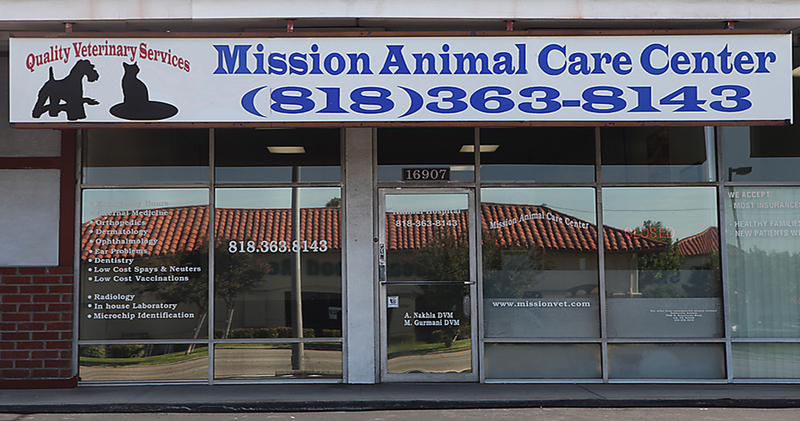 Mission Veterinary Clinic and Animal Emergency Hospital is located at 16907 San Fernando Mission Blvd. We are 500 Feet east of Balboa Blvd. on the North Side of San Fernando Mission Blvd. We are located Near the Two Guys from Italy Restaurant. Directions to Hospital from Simi Valley. 118 East Exit Balboa Blvd and turn Right (South). The First stoplight is San Fernando Mission Blvd. Turn Left (East) on to San Fernando Mission Blvd. Drive 500 feet and we are located on the left or north side of the street. Directions to Hospital from Valencia/Newhall: 5 Freeway South, 405 Freeway south 118 freeway west. Exit Balboa Blvd and turn left (south). At the first stop light (San Fernando Mission Blvd) turn Left (East) Drive 500 Feet and we are on the Left or North Side of the Street. Directions to Hospital from Glendale / Burbank: 5 Freeway North to 405 North to 118 freeway west. Exit Balboa Blvd and turn Left or South. At the first stop light (San Fernando Mission Blvd) turn Left (east) Drive 500 feet and we are located on the Left (North) side. Directions to Hospital from Pasadena: 210 freeway west to the 118 freeway west. Exit Balboa Blvd and turn Left (south). The First stop light is San Fernando Mission Blvd turn Left or East. We are located 500 feet on the left or north side of the street. Directions to Hospital from Los Angeles: 405 Freeway North to the 118 freeway West. Exit Balboa and turn Left (south). The First stop Light is San Fernando Mission Blvd. Turn left (east). We are located 500 feet on the left side or north side of the street.